Price cuts of up to 30 percent being offered by some developers are failing to attract foreign property buyers to Cyprus following negative publicity and government inaction. THE LATEST figures from the Department of Lands and Surveys show that 146 property contracts for foreign buyers were deposited last month compared with 160 a year ago. 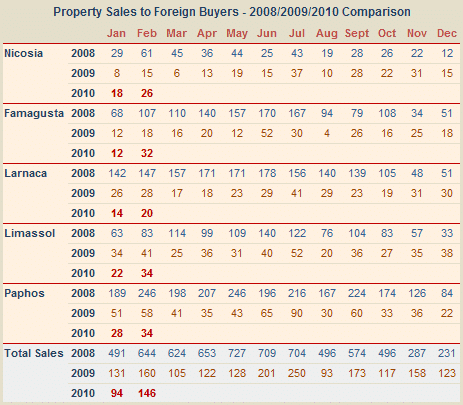 Foreign sales in February were down 9% on the same period in 2009. Although property sales in Nicosia rose by 73%, it is unlikely that this was due to overseas investors as it is not an area favoured by expatriate second home buyers. In all but one of the investment hotspots the decline is continuing, but at a slower rate than reported last month. Sales in Larnaca were down 29%, in Limassol they fell by 17%, and in Paphos (where some developers have been offering 30% discounts and other incentives) they were down by 41%. Sales in Famagusta rose 78% compared with a year ago, but this may be due to British expats who can no longer afford their mortgage repayments selling to ‘vulture funds’ and individual investors who are picking up distressed property at rock bottom prices. Keeping up with their mortgage repayments is a particular problem for those who took Swiss Franc mortgages with Cypriot banks. Attracted by the low CHF interest rates, they been hit very badly by the Sterling/CHF exchange rate. At the start of 2007 a Pound Sterling would buy 2.39 Swiss Francs; today it will buy you around 1.61 Swiss Francs. And there is another problem for buyers who took out mortgages with banks in Cyprus. When they signed their agreements, the interest was typically set at a Base Rate of 2% plus the monthly LIBOR Rate. But although the LIBOR Rate has dropped in recent months, helping to offset the negative impact of the fall in Sterling, many Cyprus banks have increased their Base Rate due to the increase cost of borrowing money. As a consequence some buyers find themselves having to pay almost twice as much than they budgeted for when they bought their property. Negative publicity about the problems associated with buying property in Cyprus and government inaction continue to headline in the UK press. The Interior Minister promised that new legislation to deal with the Title Deed problem would be ready by the end of 2008. But this statement, like similar vacuous statements made by his predecessors, proved to be nothing more than hot air. However, in July 2009 the Interior Minister proposed legislation designed to deal with the Title Deed problem and invited comments from interested parties. But the proposals were criticised by many, including the Cyprus Bar Association who rejected them saying that they would “lead us into a labyrinth without solving the problem”. The government is continuing to work on legislation to resolve the problem, allegedly. A recent High Court ruling in London that the Orams must demolish their villa in the occupied area of Cyprus and give back the land to the original owner has confused many potential buyers and put them off buying property on the Island. Why do you always seem to focus on the negative aspects of the property market in Cyprus? We were unlucky enough to buy a property in Mesa Chorio, near Paphos from Y. Liasides Developers through Nicholas & Tsokkas (Agents in Paphos). Unfortunately they were both crooked!! I believe they were both aware that Liasides was in serious financial difficulties when I was sold the property. I have tried to gain recompense through the Estate Agents Association in Cyprus but they did not even give me a response. Do you know what the present situation is with Yiannis Liasides? I would be very cautious if I were to buy a property in Cyprus with this Title Deed fiasco. Who needs the hassle, it is confusing enough when you are buying abroad. So come on Mr Interior Minister get your act together with the Cyprus Bar Association and try and sort these problems. The first question any potential buyer would ask is has the property got Title Deeds ?? Therefore, as we all know, we need to have a system that works (no easy task) but where do you start the whole situation is a mess. Is it just me but does anyone find this news unusual? I mean, banks that change their (not so) “iron clad” loan rate agreement contracts, developers that hold onto deeds and then effectively keep ownership while professing to sell the property at the same time, archaic property laws that somehow allow such developers to take advantage of foreigners while untrustworthy politicians get nothing done to clean up the problem and people are surprised at a significant drop in foreigner purchases? I would think the fact that any foreigner would still dare to buy in Cyprus at all would actually be the interesting surprise. Cyprus has been over developed over the past few years and now ‘the chickens are coming home to roost’! Like Spain, developers and it has to be said greedy land owners thought that the boom would go on and on. The party is now well and truly over which hopefully will result in more realistic and sustainable property prices.